When it comes to making the most of YouTube, the social network more than does its best to help you out – it offers a range of free tools to help fine tune your uploads and maximize your video marketing efforts. 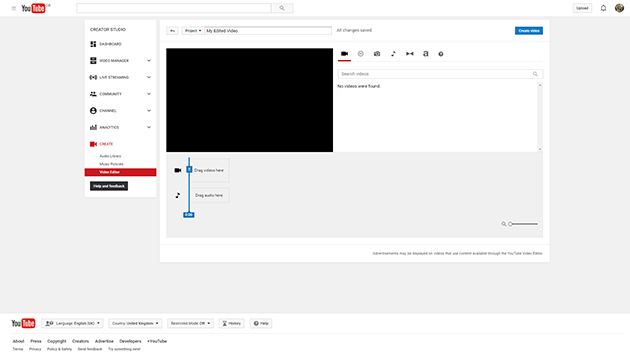 If you’re just getting started, arm yourself with our guide to get to grips with YouTube tools. You’ll be editing and broadcasting like a professional in no time! First up is the YouTube video editor. There are lots of video editing options around, including professional suites such as Adobe, but they can be expensive and, due to their enterprise level capabilities, require some serious training to get the most out of. Combine clips from different videos, images or segments to create a single video. The Editor will accommodate up to 50 clips and 500 images, meaning you can edit and re-order and be as creative as you dare. Trim clips, to make them shorter or remove bits you don’t want to make public such as outtakes and set-up shots. You can also lengthen videos and clip them using this part of the Editor. Add music to act as a soundtrack and adjust volume levels – you may want to turn a music backing track down when someone is speaking for example. You can do that here. Special effects tools make it easy to turn a standard clip into something more engaging. Options include rotating frames, adding text and modifying video speed (slow motion or speed up). The thumbnail clip that viewers see ahead of playing your video is important, as this can often make the difference between clicking and moving on. To ensure you show off the best of your video and get as many views as possible, you can use the video thumbnail tool to upload a custom image. After uploading a new video to you YouTube channel, you’ll see a ‘custom thumbnail’ link. Click on this and you’re given the option to upload a custom image. The image must have a resolution of 1280x720 (with minimum width of 640 pixels) and be in a standard image format such as Jpeg or PNG. See full instructions here. You can customize your YouTube channel to help tie it into your overall brand identity. Customization options include adding banners and channel art. Channel art gives your channel a custom appearance, making it easy for viewers to recognize your brand in future. Adding custom artwork is easy. Simply sign in to YouTube and click on the My Channel link from the left hand menu. Go to Add Channel Art at the top of the screen and upload your preferred image. Think of your channel art in the same way you do your Facebook or Twitter cover images. You can use text and logos. The minimum dimensions for your channel art are 2048 X 1152 px with maximum dimensions of 2560 X 423 px. You can change your artwork as often as you like – just go to your channel and then hover over the existing image, much as you would on Facebook to change your cover. 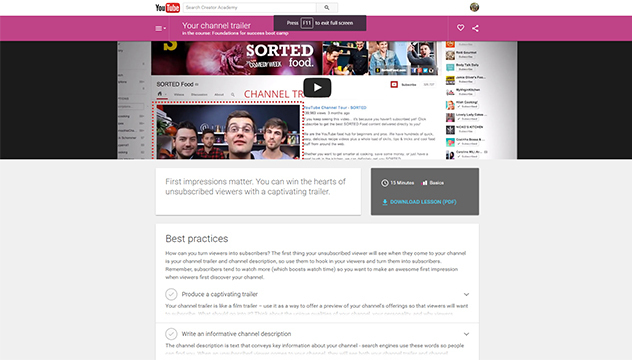 One of the coolest tools that YouTube offers its channel owners is a channel trailer feature. Think of this as a movie trailer – it is shown to viewers who haven’t yet subscribed to your channel. The point of the trailer is to entice those potential new viewers to subscribe, so use it to give a real flavor of your channel. To add a channel trailer, first check that channel customization is enabled by clicking on the edit icon on your channel page. Select edit channel navigation from the menu and click enable. Now, go back to your channel and click on the ‘For New Visitors’ tab. Click the Channel Trailer link. Upload your trailer. You can promote a new video using the featured content option. This is shown to channel subscribers – much like you might see a promo for the next episode of your favorite TV show when watching something else on the same channel. The Featured content tool gives you the ability to select a video or playlist to embed across all of the videos uploaded to your channel. It will then show to subscribers no matter which video they decide to watch. You can set this to show your most recent video, allowing you to promote your newest uploads, or you can pick a specific video from your channel. To set up, go to your channel homepage, click on the ‘Returning Subscribers’ option and then select the content you’d like to feature.